"...strongly recommend this book to all agricultural libraries and to attention of plant protection and extension service specialists as well as to persons growing roses in their home gardens." What’s new in the EXPANDED Second Edition? 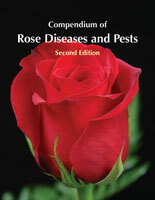 The Compendium of Rose Diseases and Pests, Second Edition has been thoroughly updated, expanded, and given a new format with color throughout to provide the reader with the most current and relevant information available in a user-friendly manner. The new second edition includes information on insects and mites with 68 images to help identify these pests and the damages they cause. 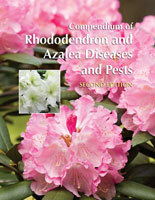 The purpose of this new edition is to aid plant pathologists, entomologists, horticulturists and other related specialists as well as rosarians, in the diagnosis of rose diseases and pests. 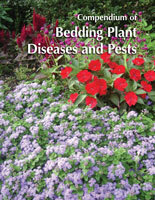 It is designed to serve as a practical reference and resource for rose growers and gardeners, students, researchers, educators, crop disease and pest consultants, advisors in state and federal government and regulatory agencies, agribusiness representatives, the pest control industry, county agricultural and cooperative extension agents, and area crop specialists worldwide. 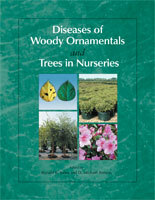 Authors R. Kenneth Horst and Raymond Cloyd have distinguished backgrounds in writing on diseases and insect problems associated with ornamental plants. The senior author has been an active educator, researcher and writer on ornamental diseases since the early 1960s. His writing includes more than 230 publications in scientific and trade journals and several books including Compendium of Chrysanthemum Diseases. The co-author is well recognized for research and extension publications on insects or ornamental plants since the mid 1990s. He has held positions in private industry and authored a book on IPM for gardeners. Color photographs of infectious disease symptoms, now inset with the text, enable users to identify diseases which affect roses and quickly understand the causes, life-cycles, and treatment approaches available. Noninfectious symptoms, such as those caused by pollution and toxicities, are covered and illustrated with color photographs that help distinguish them from bacterial, fungal, nematode, and viral symptoms. A new color section on pests and the symptoms they cause helps users to identify the insects and mites that attack roses. A genealogy map of rose species provides a guide to development of hundreds of rose species. "...timeless in its subject matter...this authoritative reference provides up-to-date information for the global community concerned with growing roses." "A must-have especially for professionals in the field." "...a good buy for rose enthusiasts and commercial rose growers, and also for students and applied plant pathologists and agronomists wishing to identify and manage pests and diseases, including nematodes, on roses. The book is a must for public, college and university libraries. This colourful and informative book represents value for money."